Magical | Anime With A Side Of Sarcasm! Now that all of that is out of the way. I have decided to keep with the tradition of having my Christmas list of animes list like last years, The 12 Anime Days Of Christmas!!! This year we are going to do the 5 Days Of Christmas Animes! Ok so let me start by saying that you need to throw out your ideas of Stanta being some jolly rolly polly old man with a beard for this anime. Santa is soooo far from that. Hell I will even give you a bit of a spoiler and tell you that there is more than one Santa. One even really has nothing to do with the north pole, presents and all that jazz. This anime is cute in the sense that it makes you feel all warm and fluffy on the inside with Christmas joy. Sorry couldn’t keep from gagging while writing on that one lol… Honestly though it is cute. Once you get past the first 5-10 min of bah! humbug-ness in the beginning. Which to tell the truth is more my speed leading up to Christmas day which usually I’m good with. As I said before throw out your notions on what you think Santa is and you will make it through to the end with only a few WTF?!? !’s thrown out there. Cause everyone laughs and rightly they should! What parent names their child Santa?!?! Besides that, there are other random things thrown out there like the Santa academy where the other main characters are from, magic, a random Japanese gang, Christmas cakes (Yum! ), a toy reindeer that transforms, the beach and a crazy Miss Noel that is a teacher at the academy. It’s an extremely short OVA with 2 22min episodes with a ‘hint’ at the end of a 3rd that is then thrown out by saying it’s a joke. Which to me is really lame cause they made an awesome fake preview! They cram A LOT into this little anime and it feels a bit rushed at times but overall it’s a good one to watch over the holiday. Have to start of with I’m a sucker for magical animes!!! That in its self gives it 2 stars to start! Just watched the first couple of DUB’ed streamed episodes this week and I LOVE it! Story line so far is your basic magical anime where magic is part of everyday life. There are guilds across the land that house magicians that work on their craft, find posted jobs that require magicians and just have a place to call home and hang out. 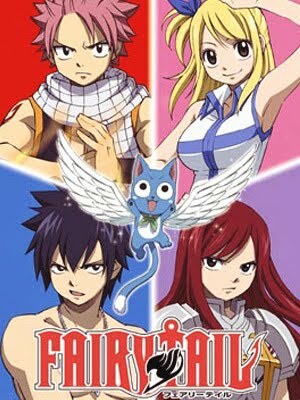 The top guild that everyone wants to be in, especially one the main characters Lucy (who is a celestial wizard), is of course Fairy Tale. On her way to the guild she runs into trouble in a small town which leads her to the other main character, Natsu, with his talking cat happy. As the story progress in the first two episodes she finds out Natsu is not only a member of Fairy Tale and her ticket in but, he is also a powerful fire magic user. The third and fourth episode finally has the two of them teamed up and headed off to their first ‘mission/job’. Like any other magical anime there is plenty of antics that abound with each and every thing that happens. Also Lucy is a bit…high strung. Ok more than a little, a lot. Happy the talking cat is well, a talking cat. Natsu is a little coo-coo for coca puffs at times but generally not as annoying as you would think. Definitely looking forward to see how this plays out!